You’ve seen the stats: Companies that focus on customer experience (CX) — on positive brand-consumer interactions — win additional purchases, loyalty, favorable word of mouth, and revenue growth. And “if your customer experience falls behind, then customers will switch to your competitors,” says CX leadership expert Bruce Temkin. Customer experience develops over the course of multiple, varied interactions. These interactions, over time, form customer journeys. It behooves brands — really, all consumer-facing organizations — to understand the journeys undertaken by their customers and prospects and to guide them to positive outcomes. Clarabridge, a customer experience solution provider, has undergone its own CX journey in the decade since the company’s founding. This article is my report on that journey, with reflections on the overall shape of the larger CX industry, occasioned by my attending the recent Clarabridge Customer Connections (C3) conference. Clarabridge consulting VP Koren Stucki noted at C3, “customers will define their own journeys,” an important point. Brands control many of the interaction points but can only seek to hear, and perhaps to influence, opinions expressed online and on-social, that is, consumer word of mouth. Stucki observed that “empathy is really critical.” She advocated creation of journey maps that help a brand “understand from the customer’s perspective, what they’re feeling, what they’re doing, what they’re thinking.” Map, model, and measure — and then analyze and apply the insights you’ve generated — these are key ingredients in customer experience management (CEM) initiatives, supported by software platforms such as Clarabridge’s. Before getting further into my conference report and CX observations, I’ll provide a bit of Clarabridge product background. The Clarabridge Customer Experience Intelligence platform. How many channels? Yuchun Lee became CEO in January, with visionary company co-founder Sid Banerjee moving into the executive chairman’s role. (I interviewed Banerjee, on intelligent customer experience, back in 2013.) According to Lee, Clarabridge-supported CX coverage expanded from eight data sources in 2012 to twenty-nine in 2016. Clarabridge’s largest customer tracks eighty data channels. “The Clarabridge platform is a hub for all of this data, giving you a complete view of customer sentiment,” states the company’s Web site. Proprietary text analytics capabilities reside at the core of Clarabridge’s platform, designed to extract, classify, and aggregate customer facts and feelings from online, social, and enterprise data. Clarabridge acquired survey provider Market Metrix in 2014 and social-media analytics vendor Engagor in 2015, broadening company capabilities. 3) Clarabridge has moved away from the intelligent customer experience (ICE) messaging of past years — it is now implicit that customer experience management (CEM) relies on two senses of intelligence: information and (analytically-informed) judgment — toward adoption the now-pervasive customer journey metaphor. Yet while Clarabridge seems a leader in handling and deriving insight from interactions along the customer journey (each “touchpoint”), journey modeling isn’t (yet) part of the Clarabridge toolkit. 4) An observation not at all specific to Clarabridge: There’s a lack of scope agreement about customer experience. Yet an organization’s brand promise provides a measuring stick for customer experience, so since price is part of Walmart’s promise, arguably Walmart does compete on CX. I know from a February Twitter exchange that Gartner analyst Augie Ray sees CX this way, so I asked him what he thinks. Augie Ray’s view is that “Price is part of the customer experience for a product or service. Consumers don’t expect the same experience from Walmart as they do Nordstrom, nor do they expect the same from UberX as they do a black car service. Customer experience is the collection of customer perceptions and emotions they have interacting with the brand, and one of those perceptions will involve an assessment of value delivered versus the cost. What might be a good, loyalty-building experience for one brand may be disappointing for another based on different price levels. So revise what I wrote at the start of this section: There’s a lack of agreement about both customer experience and which metrics matter. But the importance of attitude — of subjective feelings, expressed directly and indirectly as opinions and emotions, and measurable via sentiment analysis — is something we call can agree on. Consultancy Temkin Group has even labeled 2016 “The Year of Emotion,” and Emotion and Impact is the key thematic point at a conference I organize, the Sentiment Analysis Symposium, taking place July 12 in New York. 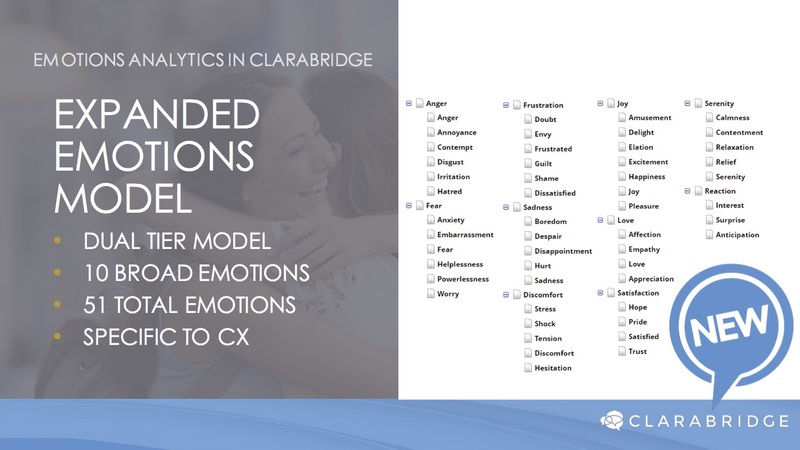 5) Clarabridge plans to launch emotion-analysis capabilities this summer, expanding sentiment analysis beyond the current eleven-point, positive/negative scoring system. The premise is that experiences generate emotion so that correlating emotions and interactions can help a company create more satisfying interactions, favorable for loyalty, motivation, advocacy and other good stuff that’s ultimately realized in revenue. Clarabridge natural language processing (NLP) lead Ellen Falci previewed emotion analytics at C3. The new capabilities — they feature 51 categories in a two-tier model — are timely and seem coherent, well thought out, and well presented. Consider this write-up an advance look-out. I’m looking forward to the roll-out. 6) Clarabridge is also aiming to provide insights that are more business-useful, enabling what Nithi Vivatrat termed “CX situational awareness.” The company will make it easier for users to create new metrics and provide new features such as “top box” and “bottom box” scores, which look at proportions that choose each survey-response category, period-over-period reporting, and a structured-data widget. Clarabridge is adding text analytics capabilities to Engagor and strengthening core-product text analytics with new named-entity and concept recognition abilities and application of newer, advanced machine-learning algorithms. These functional improvements are complemented by performance gains stemming from an on-going platform reengineering effort, which has also made it possible Clarabridge to refactor analytical models when needed. 7) Clarabridge now looks beyond text, via speech-to-text transformation powered by a partnership with Voci Technologies. Another alliance, with Ditto Labs, adds brand-image analysis capabilities to the Engagor social analytics product. Now, I wouldn’t call the Ditto capability hugely advanced. It doesn’t attempt (or deliver) the generalized image-content identification capabilities you get via MetaMind, IBM Watson (AlchemyAPI), or open-source deep-learning toolkit XYZ trained for what-have-you. But you have to start somewhere. A surprising number of my C3 conversations touched on contact centers, on the desire to mine recorded agent-customer interactions for business intelligence. This sort of stuff is bread-and-butter for Verint (a Clarabridge text-analytics engine licensee), NICE Systems (which last year augmented their voice capabilities by acquiring Nexidia), CallMiner, and other providers. Actually, quite a few of the folks I spoke to work with these providers, particularly Verint. I suppose the explanation is that while Verint and other providers mentioned have customer experience capabilities that rival Clarabridge’s, their focus has been on contact centers while Clarabridge’s has been on surveys. 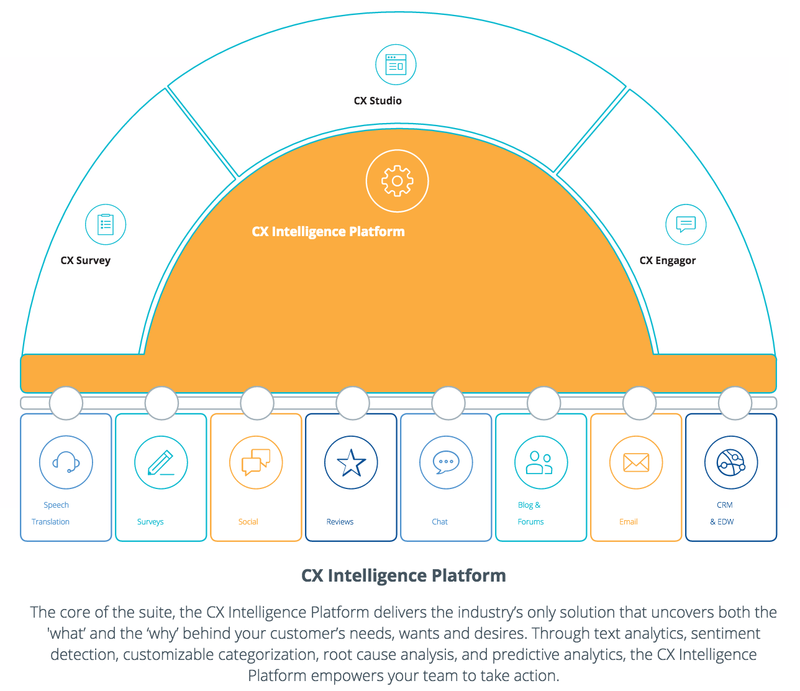 Clarabridge customers and prospects I met at C3 also work with social and survey analysis suppliers that include Bazaarvoice, Crimson Hexagon, Sprinklr, and Sysomos and with at least one other customer experience solution provider, InMoment. I expect that customers will pare their supplier lists as time goes by. When they do, in most cases — judging from my C3 customer conversations — Clarabridge should come out on top. Clarabridge is positioned for market growth. Strong customer connections provide a foundation, but the company does face significant competitive challenges. Intensified investment in CX leadership, in product, and in analytical technology will prove critical, intensified investment in innovation, but the ingredients are in place. Clarabridge has traveled a mostly-charmed customer-experience path to date. May the journey ahead prove as rewarding.